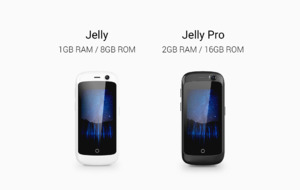 Jelly is an Android smartphone with 4G network support which comes with 2.45-inch screen Size. It is available in two variants Jelly and Jelly Pro both runs on Android 7.0 Nougat. Jelly sports a 2.45-inch screen with 240 x 432 pixels powered by a quad-core 1.1 GHz processor and comes in two variants: one with 1 GB of RAM and 8 GB of internal memory, and a Pro variant with 2 GB of RAM and 16 GB of storage with MicroSD card support up to 32GB. Manufactured by Unihertz, a China-based company, Jelly can be ordered worldwide via Kickstarter for prices starting at $59. and the phones should start shipping in August.